A fire outbreak has completely burnt down the Independent National Electoral Commission office in Qua'an Pan Local Government Area of Plateau State. 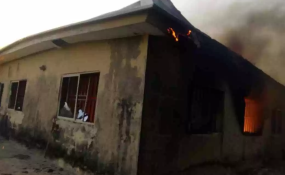 "The INEC office in Qua'an Pan has been engulfed by fire causing a setback for the preparations for the general elections in the Local Government Area," the official wrote. "A drunken security man was said to have caused the fire outbreak. The office is completely burnt with all its content ie Ballot Boxes, Generators serviced and filled with fuel, cubicles, newly printed electronic and manual Voters Register, uncollected PVCs, materials for the preparations of RAC and other materials yet to be identified." Qua'an Pan LGA is among the six LGAs in the Southern senatorial district of Plateau State.